Shaw Floors are one of the premiere manufacturers of hardwood floors on the market today. From genuine solid woods and high-tech engineered collections, to their cutting edge Epic line, these craftsmen create some of the finest floors in the industry. As Shaw prides themselves on their high attention to details, they are also passionately committed to providing homeowners with a sustainable product. Reducing milling waists, Shaw has also begun introducing collections made specifically of wood by-products. Additionally, incorporating innovative technologies such as VersaLock�, Silent-Step� and Durashield XL, Shaw has remained a trusted manufacturer in flooring since first opening doors in 1946. The collections can be divided into three basic categories. Solid woods are cut and milled from single boards for the purest natural beauty. Engineered woods are stacked and bounded under heat and pressure for a more durable construction while still exhibiting the look and feel of solid wood. Lastly, the Epic line features some of the latest advancements in sustainable technology. This revolutionary new line is made from EnviroCore recycled wood fibers for a long life with low environmental impact. The Shaw hardwood family includes numerous collections that speak to a number of d�cor styles ranging from traditional to modern. The Brushed Suede collection resembles the appeal of reclaimed wood whereas the bold 8� wide Grand Canyon collection exudes a time-worn elegance for timeless beauty. 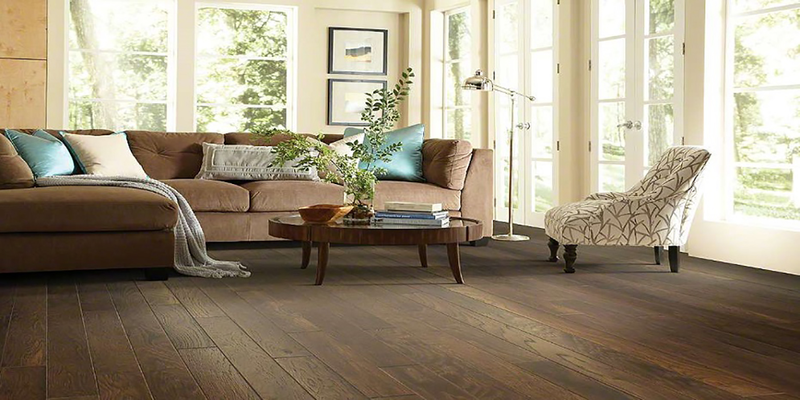 The Pebble Hill Hickory collection is greatly loved for its rustic-yet-refined appeal with distinct wood grains and unique shades. The Chimney Rock collection presents staggering board lengths adorned with high color contrasts for an eclectic twist on classic hardwood. The sleekness and mysteriously dark shades found within both Metropolitan Maple and Smooth Sailin� are perfect for the modern d�cor.